The European Commission has said it is "delighted" that the leaders of France and Germany have backed the creation of a "real" EU army. A spokesperson for commission president Jean-Claude Juncker said he was "pleased" the argument for the force seemed to be "going in our direction". 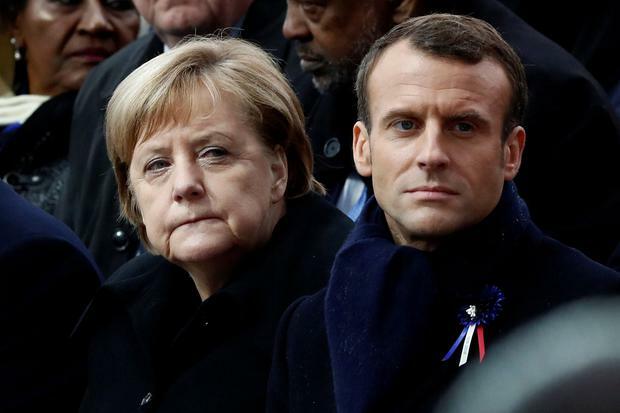 Addressing the European Parliament this week, German Chancellor Angela Merkel said she supported a "real, true" European army, echoing an identical call by French President Emmanuel Macron the week before. Speaking yesterday, a commission spokesperson tried to attribute credit for the idea to Mr Juncker, noting he had previously endorsed such a force. "Let me clarify that the first one who spoke about the EU army four years ago was someone called Jean-Claude Juncker," he said. "Memory is short nowadays in Brussels and the capitals but, people here present, you are aware of who launched this idea." The spokesman added: "We are delighted that both the president of the French republic and the German chancellor, with a few days' interval, publicly backed this idea. "We have many times explained how we see these things: this is a commission that wants Europe to have a meaningful defence identity." He noted the commission had "proposed a significant increase in new EU resources for defence" in the coming budget. Proposals for a European military have triggered a new spat with US President Donald Trump, who took offence to a suggestion by Mr Macron that such a force could ensure Europe's security in the shadow of the United States. The French president made his call during a radio interview last week: "We have to protect ourselves with respect to China, Russia and even the United States of America. He added: "When I see President Trump announcing that he's quitting a major disarmament treaty which was formed after the 1980s missile crisis that hit Europe, who is the main victim? Europe and its security." The suggestion angered Mr Trump, who sent a series of hostile tweets about the comments. Earlier this week the US president tweeted: "Emmanuel Macron suggests building its own army to protect Europe against the US, China and Russia. But it was Germany in World Wars One & Two - How did that work out for France? They were starting to learn German in Paris before the US came along. Pay for NATO or not!" Commission president Mr Juncker said last year that "deference to Nato can no longer be used as a convenient alibi to argue against greater European efforts". In 2016, Britain's then defence secretary Michael Fallon said the UK would use its veto to stop the creation of any EU army. However, because of Brexit, it will no longer have any say. A number of proposals have been put on the table for how EU nations could co-operate more closely on defence. The European Commission has previously said existing closer defence co-operation "is not about creating an EU army". Thirty-four joint missions by member states have been launched under the EU flag since 2003 under the bloc's common security and defence policy. Under the "permanent structured co-operation" initiative legislated for in 2009 and activated in 2017, 25 of the 28 armed forces are in the process of stepping up co-operation between their armed forces. Denmark, Malta and the United Kingdom have decided to opt out of the voluntary system.